Jesus replied, "Anyone who drinks this water [from Jacob's well] will soon become thirsty again. But those who drink the water I give will never be thirsty again. It becomes a fresh, bubbling spring within them, giving them eternal life." So often, we settle for facade and not substance. All too frequently, we take the shortcut and miss the destination. 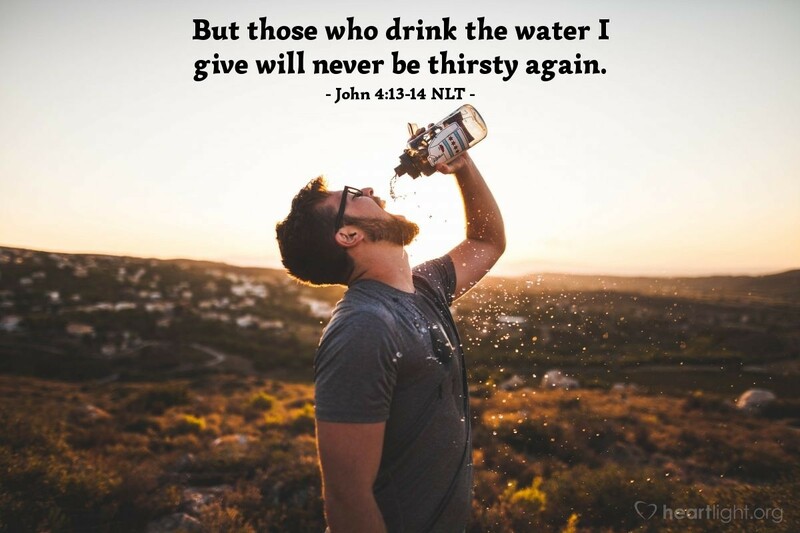 Only Jesus can supply the water that our thirsty souls desire. Only he can fill the emptiness and the ache. An amazing promise of Jesus' gift, his blessing, his refreshment, is that it is lasting. This water that Jesus gives is a spring of water, not a cistern. It is living, not static or stagnant. This water gives life, and this life provides more water. (Later in his ministry, Jesus' makes clear this water is the Holy Spirit — John 7:37-39.) God comes to live in us through the Holy Spirit. God fills us with his life through the Holy Spirit. God cleanses and transforms us by his Spirit. God quenches our thirst with the Holy Spirit that Jesus gives. O God, even now I find, at times, that my soul needs to be filled, my thirst needs to be quenched, and my hunger needs to be satiated. I'm not sure, dear Father, why the spiritually dry periods come. I gladly confess, however, that they make my desire to experience Jesus' living water more intense. I have tasted your goodness. I have drunk from your Fountain. Keep your life-giving stream flowing in me. In Jesus' name, I pray. Amen.